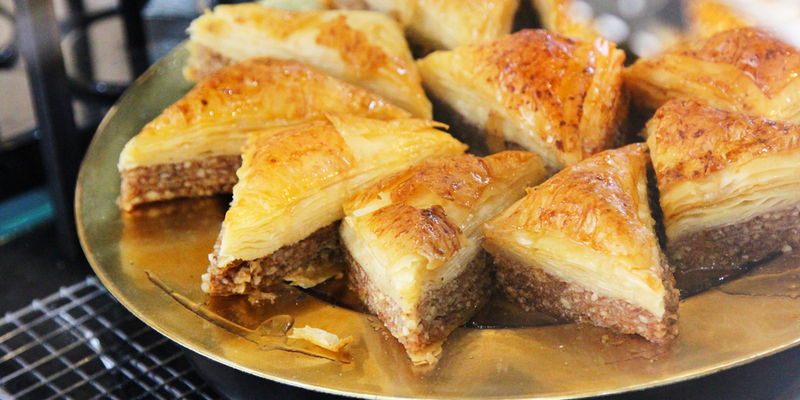 Abboud Bakery is more than just a bakery. The Underwood locale has created a stir in the local community thanks not only to its tasty and wholesome Middle Eastern fare, but also for its heart-warming concept. The bakery – staffed by a team of refugees – is not only bridging cultures in the local community, but also giving employees a chance to utilise their skills while learning for the future. The beginning of the Abboud Bakery journey began with a chance meeting. Friends Angelo Anthony and Gus Khcheiche (a solicitor and hospitality veteran, respectively) were introduced to and George Tabbakh – a Syrian refugee starting a new life in Australia. Angelo and Gus learned of George’s struggles finding work in Brisbane, despite being a third-generation baker with some serious skill in the kitchen. As the friendship between the trio grew, Angelo and Gus could tell that George was capable of adding something special to Brisbane’s food scene and, as second-generation immigrants themselves, the idea of empowering George and educating locals on the magic of Middle Eastern cuisine resonated with the duo. Abboud Bakery (named in homage to Angelo and Gus’ mothers) is a Middle Eastern bakery and cafe that looks to employ and upskill refugees, giving them an opportunity to not only work, but learn to operate the business with the hopes of them taking over in a few years time. A vacant former bakery tucked inside Underwood Marketplace (next door to Mabrouk & Sons Halal Meats) proved to be the ideal area to plant seeds for the project, and Angelo and Gus got to work transforming the space to suit their needs. 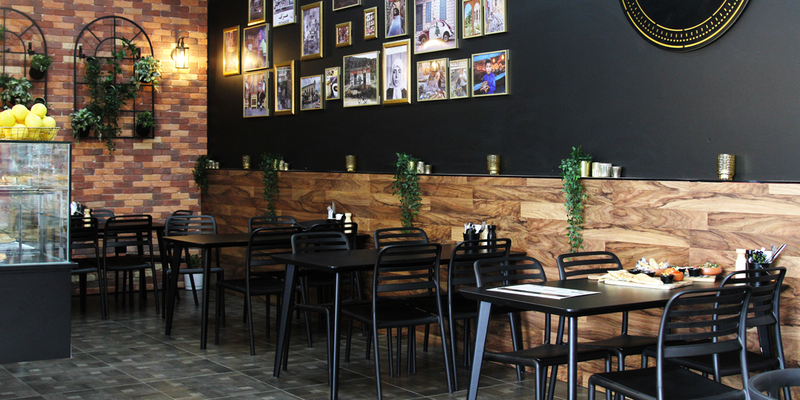 Abboud Bakery has been given a contemporary overhaul, with elements such as decorative door frames and imagery of Middle Eastern bakeries offering a glimpse into Abboud’s traditional inspirations. Wood-grain panelling and black tiles give the tenancy a moody and chic aura, while the venue’s high ceilings offer a glimpse into the kitchen (complete with a cast-iron oven imported from Lebanon), as well as a sense of space and comfort amidst the bustle of the shopping centre. George’s recipes have formed the basis of Abboud Bakery’s initial menu – a simple but wide array of baked treats and share boards with room to grow in the future. Freshly baked manoosh (a variation of Lebanese pizza) comes topped with a tasty zataar blend or stuffed with spinach and cheese, spiced lamb and cured beef sausage. Manoosh boards can be ordered to share between three, and comes with a selection of seasonal vegetables, mixed olives, labne and more zataar. A selection of small plates and lunch boards dish up morsels made locally by community groups, serving mouth-watering felafel, kebbeh, sambouski, tabouli and plenty of warm Lebanese bread and dips to devour. Desserts such as knafeh and lamington manoosh end proceedings on a sweet note, while pots of Arabic coffee and tea is available to sip alongside barista-made Campos coffee and fresh juices. The menu will expand in the future, with a greater breakfast selection to offer baked shakshuka and other Middle Eastern delights. 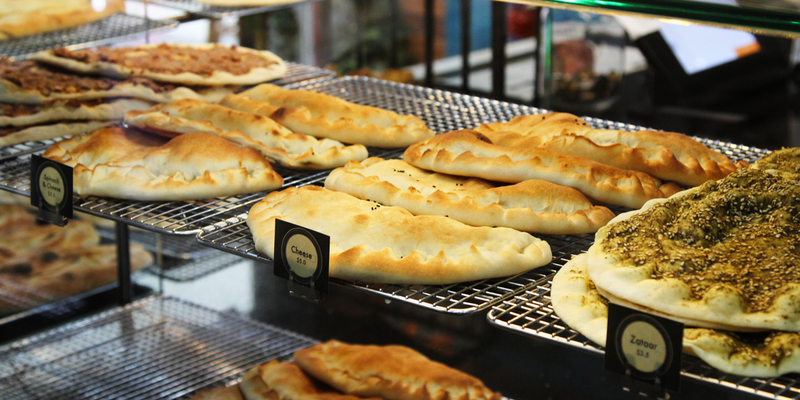 For more information on Abboud Bakery, be sure to check out the Stumble Guide.